The University of Texas at Austin is home to some 50,000 students during the school year. Being one of the best colleges in the country, it’s no secret that the students here like to work hard, but they also make time for play as well. Nestled right in the heart of the city, the University of Texas campus is full of things to do, see and eat for both college students and the young at heart. Spider House Cafe and Ballroom. Courtesy of Dan Watkins. Spider House Cafe and Ballroom 2908 Fruth St.
An eclectic cove for students and locals alike, Spider House is a place that totally adheres to the “Keep Austin Weird” mentality. The Spider House property features a grand spectacle of lights and plenty of hip aesthetic. Decorated with Christmas lights, artwork, rusted-over fixtures and a perfectly out-of-place bathtub, Spider House truly represents the true uniqueness that is Austin. The venue/café mash-up hosts events ranging from comedy shows, music and poetry slams – a little something for everyone. Located right on the edge of UT’s campus, Hole in the Wall is a great place to listen to some authentic Austin-made music. Hole in the Wall brings in bands of all kinds­ – from small local bands to national names like Gary Clark Jr. and Shakey Graves, making it one of the most legendary venues in the Austin music scene. Every night, its two stages provide some of the best live music in town. Add great food, drinks and perfectly grungy atmosphere, and you’ve got a night to remember. Cain and Abel’s 2313 Rio Grande St.
At the University of Texas, football is everything. If you can’t get your hands on a pair of tickets, one of the best places to cheer on the Longhorns is at Cain and Abel’s. As it’s located right in the heart of West Campus, you’ll be sure to be surrounded by a sea of burnt orange as you watch the beloved team fight for the winning title. Aside from being a great game day spot, Cain and Abel’s is the go-to place for some students as perfect way to start the weekend. Go with friends, share some food and drinks and unwind after a long week of studies. Cactus Café 2247 Guadalupe St. 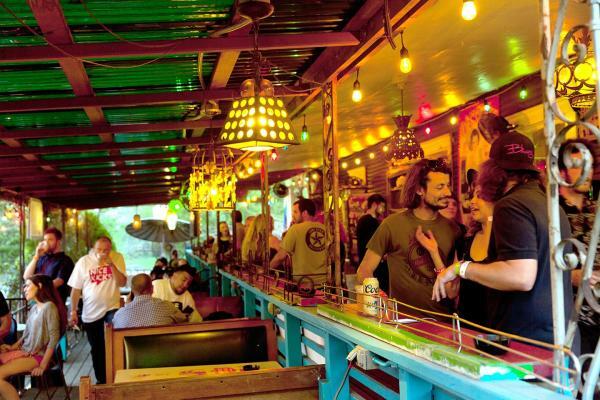 Founded in 1979, the Cactus Café has been a staple in the Austin community as the go-to place for acoustic sets. Defined by its intimate setting, Billboard magazine named the Cactus as one of fifteen "solidly respected, savvy clubs" nationwide. What’s better is that it’s located right on UT’s campus, making it an easy place to go to catch a laid-back concert with friends. Complete with a full bar and a lineup of daily shows, the Cactus Café is a staple of both the University of Texas and Austin. In a town that’s home to college students and coffee lovers alike, coffee shops are everywhere. Being a senior at UT, I have spent my fair share of late nights studying at just about every coffee shop in Austin. If you find yourself and craving a cup of joe or a small bite to eat, head over to some of Austin’s favorite late night spots like Bennu Coffee, Buzz Mill and Epoch Coffee.